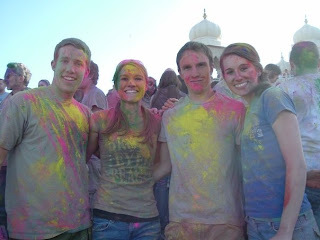 A few weeks ago Jakie and I went to the Festival of Colors at the Hare Krishna Temple in Spanish Fork. The festival is to celebrate Spring (sadly it's been snowing since). 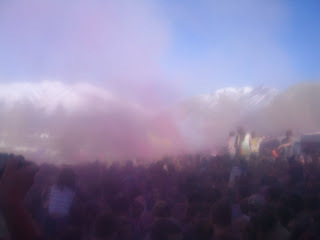 After a countdown, and an obligatory burning of an effigy, everyone throws colored powder at everyone. Seriously so much fun. Bad picture because my camera was in a plastic bag, but you can see the cloud of colors. There were thousands of people there. Here is the after- Me, Jakie, sister Jenessa and friend Isaac. Don't be too jealous, you all can come with us next year. I've never heard of such a thing. Sounds like fun though! You guys are really livin' up the married life! you guys always do fun things! how is school. almost ready for summer? member when we met up in vegas? i liked that. a lot! Oh we are so excited to come to Utah for a change! We will for sure have to double! Holi Moli! I guess I should be glad you do your own laundry now! How fun! Congrats on the scholarship too. You are an amazing woman. Uncle Jeff and I went to SF last week. Made me think of our week-end in the city. We need a repeat!